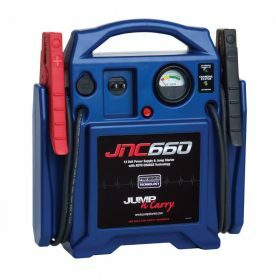 There are five best 10 to 19 Volts Jump Starters for your picking up. They can help you when your car drop anchor. Trust me, the following five products will offer you five best choices. All of them feature powerful energy offering system and can make your car engine relaunch. Just have a look and make a decision. The The JNC660 delivers 1,700 peak amps and 425 cranking amps of battery-charging power to a disabled vehicle. It features the company’s proprietary PROFORMER battery, which is made for maximum power density and durability. With its powerful delivering function, it have been the jump star in most markets. What’s more, the product dimensions are 16.3 x 14.1 x 5.1 inches and the item weights 18 pounds. 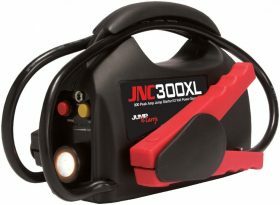 The Clore JNC300XL ‘Jump-N-Carry’ 900 Peak Amp Ultraportable 12-Volt Jump Starter features full size clamping to penetrate battery corrosion. Its Clore PROFORMER battery provides as much or more power than much larger jump starting batteries. What’s more, the unit features a flashlight to aid in nighttime and other emergency jump starting situations. Plus, the product dimensions are 12.1 x 7.3 x 7.5 inches and the item weights 9 pounds. 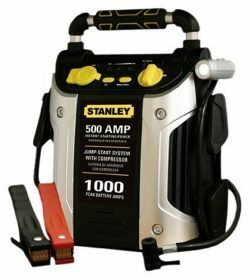 The Stanley J5C09 1000 Peak Amp Jump Starter with Built in Compressor includes a 120 PSI air compressor, DC & USB charging plugs and a high powered LED light that rotates 270 degrees. The unit has consists of reverse polarity alarm for safety along with a top-mounted rubber molded handle for easy grip. Also, it provides offers a convenient, portable way to jump-start your battery without the need of another vehicle. 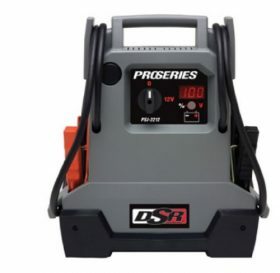 The Schumacher PSJ-2212 DSR ProSeries 2200 Peak Amps Jump Starter and Portable Power Unit has 2200 peak amps, 330 cranking amps and 275 cold cranking amps.This is a power source for all 12 Volt DC accessories that are equipped with a 12 Volt accessory plug. In addition, the product dimensions are 14 x 4.7 x 15.2 inches and the item weights 25 pounds. 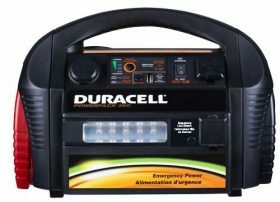 The Duracell DRPP600 Powerpack 600 Jump Starter and Emergency Power Source is built in 2 x 2100 microampere USB outlet for charging iPad, iPhone, digital cameras and cell phones. And it is there to provide plentiful power for work, recreation and emergency backup situations. In addition, when used by consumers who possess only basic technical knowledge, the emergency will ensure safe, simple plug and play operation safely.